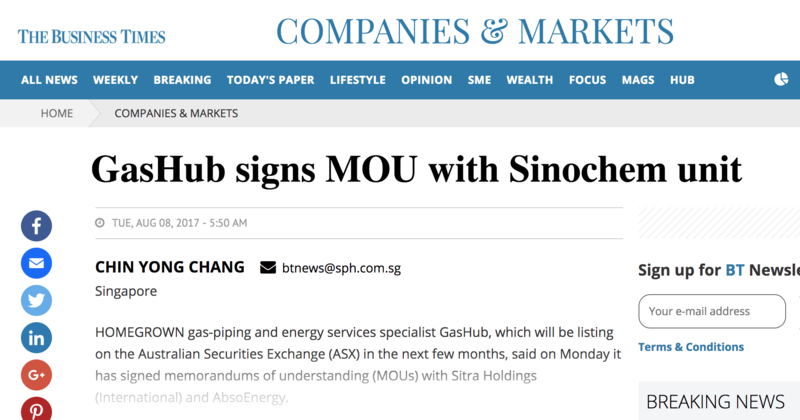 HOMEGROWN gas-piping and energy services specialist GasHub, which will be listing on the Australian Securities Exchange (ASX) in the next few months, said on Monday it has signed memorandums of understanding (MOUs) with Sitra Holdings (International) and AbsoEnergy. AbsoEnergy is the Asia-Pacific representative of Chinese state-owned enterprise Shanghai Sinochem JN Energy Co Ltd.
AbsoEnergy managing director Kelvin Sim said representing Sinochem in the Asia-Pacific region meant that all agreements and joint ventures with Sinochem will be signed by AbsoEnergy, with Sinochem being the one putting in the investments. GasHub business development director Roger Khoo said the MOUs are in line with the company’s strategic development of its liquefied natural gas (LNG) markets in the Asia-Pacific. GasHub’s MOU with Sitra establishes the joint intention of both companies to work towards a pilot implementation of GasHub’s patented 3GEX Combined Heat and Power (CHP) power solutions for Sitra’s timber-processing plant in Surabaya, Indonesia. It said this would allow the processing plant to achieve greater power efficiency, lower its energy bills and also significantly reduce its carbon footprint. GasHub said using a CHP system would result in cost savings of about 25 per cent compared with running regular heating and power systems, but the exact figure would depend on the cost of natural gas and the existing grid tariffs in the respective countries. The MOU also established the intent for Sitra and GasHub to jointly market the 3GEX CHP power solutions to the timber-processing industry in Indonesia. GasHub’s MOU with AbsoEnergy establishes the joint intention to collaborate on projects that will support the supply of LNG as feedstock for all of GasHub’s CHP installations in Singapore and the region. The MOU establishes that Sinochem would be using 40-foot ISO tanks to transport and supply LNG to any remote location in the Asia-Pacific region where there is no existing physical gas pipeline. Since GasHub’s 3GEX CHP system runs on natural gas, this MOU will allow the company to market its 3GEX technology to more players in remote locations that require electricity yet do not have existing physical gas pipelines. GasHub CEO Aviers Lim said: “These MOUs demonstrate a greater demand for cleaner energy in the region, as well as growing interest in our patented technology solutions which help businesses save on energy costs with a more sustainable natural gas supply.